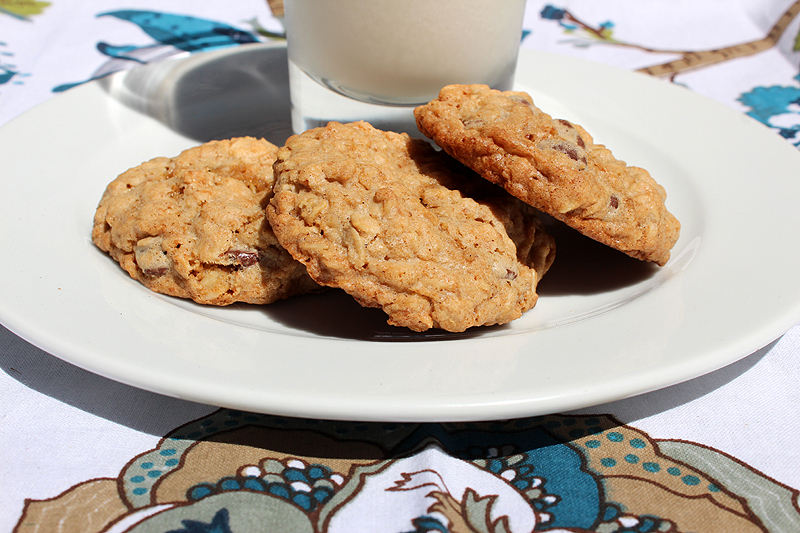 Happiness Project Recipe #16: Honey-Oatmeal Chocolate Chip Cookies! The funny thing about near constant nausea & ones inability to get any real sleep at night because of it, is how it makes you yearn for things you don’t usually have cravings for. Point in case, I’ve never been a big fan of oatmeal. Be it bars, cereal or cookies, oatmeal is just NOT my thing. I like my classic peanut butter. Or chunky chocolate chip. Case closed. Until now. Thanks to Martha Stewart, the cookie monster (within me) has awoken! And is hungry. Very, very hungry. Fortunately, for a few short hours, my roller coaster of a body decided to slow down enough for me to take a well earned breather. So, as usual, where was the first place I headed to? The kitchen. I wanted my cookies & I wanted them now! Got it? Good! Preheat your oven to 350F. Stir together the oats, honey wheat germ, baking soda, baking powder, cinnamon and salt in a large bowl. Mix your butter and sugars (granulated & brown) in a bowl on your electric mixer until pale & fluffy (about 4-5 minutes). Mix in the eggs and vanilla until fully incorporated. After reducing your mixing speed to low, gradually add in the oat mixture until just combined. Stir in your chocolate chips or raisins by hand. Using either a small ice cream scoop or gently rolling by hand, drop dough balls onto a parchment or Silpat lined baking sheet, placing them a good 2 inches apart (for expansion). Moral of the story? If I can get my cookies this easily, then you can too! Happy baking, my friends! « Happiness Project Recipe #15: Celebration Sprinkle Cake Pancakes!